It’s the last day of 2012 and I can’t help but thank the Lord for all the wonderful blessings that came with this year, and all the lessons I’ve learned. Looking back, I realize that this year has been greatly shaped by God’s message for me this year. Let me explain. Just about the strike of midnight every New Year (or thereabouts), we — my family and I, extended family, and members of our Catholic community, Elim — have our annual tradition of asking the Lord for His message for us for the coming year. Whether we are with other families, just our own family or by ourselves, we put ourselves before God’s presence. With our personal Bibles in hand, we say a simple, heartfelt prayer, asking the Lord to speak to us through His Word. We pray for the Holy Spirit to guide us and lead our hands to open our Bibles to where His personal message is for us. We also pray for the Holy Spirit to guide our eyes to read the certain passage or passages where He wants to speak to us. We then open our Bibles prayerfully and start to read, seeking insight as we do so. As a certain passage touches us, we take this to heart and continue to ponder and respond to God’s Word — whether it is something we need to apply, something we need to put faith in or something to wait on. It’s a Word that we hold on to for the entire year. As for me, the message I got for 2012 was from Zephaniah 3:14-20. This already got me excited at the get-go, since the first lines talk about joy. True enough, my 2012 was largely filled with joy. Also, through this passage in Zephaniah, the Lord somehow revealed to me throughout the months who I was in Christ — that I was His divine daughter. This happened in so many ways: through prayer, His Word, other people, walks outdoors, events, books, films, circumstances, etc. This year, I turned 40, and it’s as if new life surged through me! Whereas some of my dreams and passions were either relegated to the wayside or I was confused as to what my dreams and passions were in the first place (there was a time when I nearly got jaded! Or maybe I already was at some point…), this year saw the restoration of these passions and dreams. Some of these are writing, singing and traveling abroad. 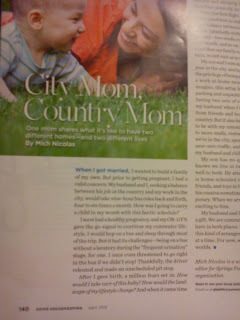 I never stopped writing (that’s part of my work, actually), but I had a new passion for it, specifically sharing my experiences with others (evidence is this blog which I only began last October; plus my articles were featured in Good Housekeeping Magazine Philippines in April and HomeLife Magazine in October). 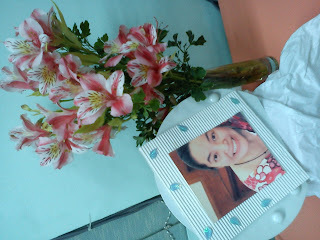 This is just a summary of how my 2012 went — all packed with God’s goodness and grace. For the record, I did have my share of trials, problems and not-so-good times (we all do, don’t we? ), but God has been faithful to see me through all of these, as I’d always go back to His Word for me for the year, and claim His promises. And now, I look forward to 2013 with so much eagerness and hope. Am gearing up for more dreams and goals. And of course — am excited yet again for whatever God’s message will be for me for the coming year. 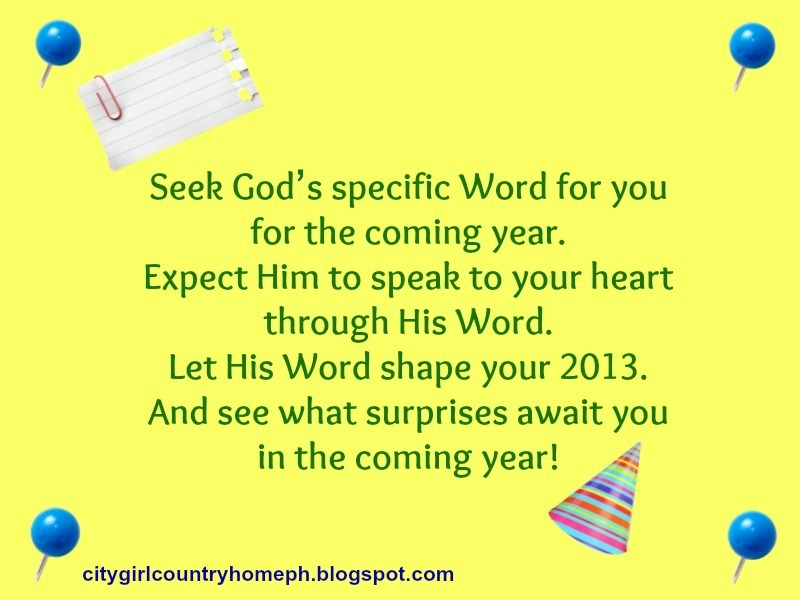 I encourage you to do the same — to seek God’s specific Word for you for the coming year. If you can do it with your family, great! If not, then find a quiet place where you can be alone with the Lord. Expect Him to speak to your heart through His Word. 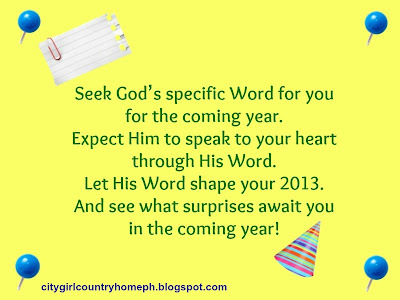 Let His Word shape your 2013. And see what surprises await you in the coming year! Have a Blessed and Hope-filled New Year! Hi Racquel! Thanks for the comment — glory to God! Blessings to you and your family this New Year! Thank you for sharing this Mich! What a wonderful way to start the year! Happy new year! Hi Mariel! You're very welcome! Blessings to you in this new year!